ZESCO United hit fourth position on the Super Division table after they edged tricky Forest Rangers 1-0 in a rescheduled Week 22 match at Levy Mwanawasa Stadium in Ndola yesterday. The victory pushed Zesco to 40 points, dislodging Green Buffaloes from fourth place. But the Ndola side still has five games in hand, giving them the opportunity to overhaul league leaders Zanaco on 55, second placed Nkana on 50 and Power Dynamos on 49. Zesco have clearly stated that they were aiming for a sixth title this year and hence needed to collect maximum points in yesterday’s tie. However, the league champions had difficulty to break the Patrick Phiri-coached side’s defence. Zesco could have taken the lead in the 13th minute but Ben Banh shot wide from a beautifully taken corner kick by John Chingandu. David Odhiambo scored the only goal of the match in the 37th minute when he headed in a Clatous Chama pass. 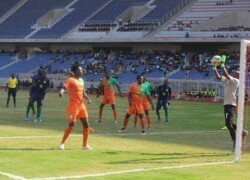 In second half, Zesco picked up speed and Jesse Were sent a scare in the 59th minute, shooting over the bar. Coach George Lwandamina substituted Mwape Mwelwa for Idriss Mbombo but the change did not have much impact on the frontline.Forest is lying 11th on the table with 28 points. Phiri said Forest Rangers faced a tough side but will have to work hard to win the remaining games. “The boys put up a strong fight but it was just not their lucky day. We will put this loss behind and focus on winning the remaining games,” he said. Lwandamina said Zesco picked the vital three points to close in on the league leaders. “What is important are the three points. The boys wasted a few chances but a win was vital if we have to realise the target of defending the title,” he said. Meanwhile, Kabwe Warriors today host Napsa Stars at Godfrey Chitalu in Kabwe in a Week 25 fixture. Napsa will be looking for three points to move away from the relegation zone while Warriors are determined not to lose at home; making it a tough tie.